I am trying to use the new Checkbox function in Google Sheets. 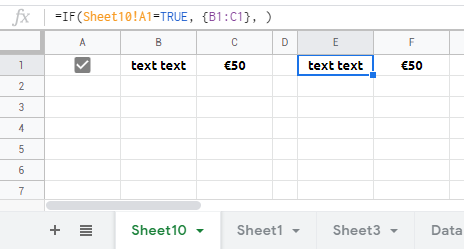 I can't figure out how If I click the checkbox in A9 on Worksheet 2 I want the Text in A10 and the $ amount in A11 to be copied to cells B10 and B11 Worksheet A. I am currently using this formula to copy the data from worksheet B to Worksheet A. So I am trying to copy the data only if the checkbox is checked. Not the answer you're looking for? Browse other questions tagged google-sheets formulas data-validation or ask your own question. Why aren't references found after copying a Google Spreadsheet?